Leanne Hatman disappears from her job at a local health spa and hotel – Eyecliffe Castle. She has been keen to get into modelling and everyone thinks she has gone to London to try and get some modelling work. Her father Darren is concerned for her safety as he claims someone was stalking her. Wesley Peterson is puzzled by the case because there seems to be no sign of the girl at all. 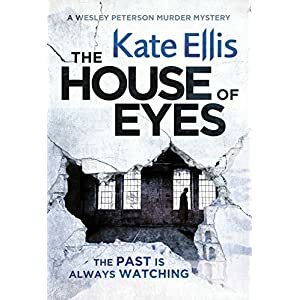 He starts to see connections when his archaeologist friend Neil Watson returns from a dig in Sicily and tells Wesley that he met Leanne’s supposed stalker there. When Neil makes some interesting discoveries on a dig near Eyecliffe Castle, Wesley starts to see connections which his boss, Gerry, thinks he is imagining. But is Wesley really on the right track or is he just trying to distract himself with a wild goose chase to take his mind off his own worries? This is an exciting and well written mystery story and every bit as good as the other books in this fascinating series which blends past and present with an expert hand. I loved the way the various strands of the story are carefully interwoven to make a satisfying whole. The themes of this story are really quite sinister and I found some scenes sent shivers down my spine as I was reading. I have enjoyed all the books in this series but I think this is one of the best so far. I recommend this book and this series to anyone who likes their crime stories with an historical element. I think the series is best read in order of publication but the books can be read as standalone novels.